On a recent Full Building Survey in South West London, whilst inspecting the roof structure we found that old baling twine had been used to strap together a broken purlin. This had probably been intended as a temporary repair but clearly had been undertaken many years ago ( and then forgotten ). 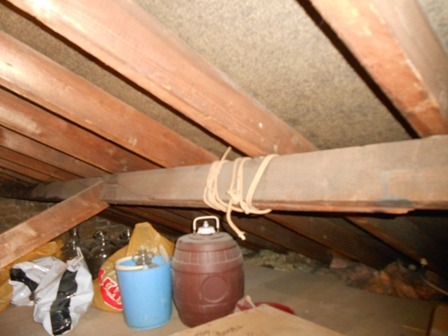 It was clear that more recently, further splitting of the timber purlin had occurred as the temporary twine had stretched – this had caused deflection of the purlin and adjacent rafters and resulted in surrounding damage to tiling. Steel plates should have been bolted to both sides of the split purlin and the repair regularly inspected. Now there is more associated repair in the vicinity of the problem which could have been avoided. Our experienced Chartered Building Surveyors are “tuned in” to finding these type of defects and giving the right advice to Clients before they buy – another reason why a pre-purchase Full Building Survey is a must when buying a property – be sure to get the experts in.